According to HSBC, there's a great pressure under Samsung's smartphone business, and the Korean company will attempt to introduce their first foldable OLED smartphone in the second half of 2016. Samsung's earlier plan was to release it in 2017. A foldable smartphone may prove to be a hugely popular device as it may merge two devices - such as a tablet and a phone or a phablet and a small phone. It may just be the differentiatior that Samsung has been seeking for years over Android rivals - and over Apple too of course. The first such device, however, may more be a technological demo than a real mass produced flagship phone. We've seen foldable displays demonstrated by several companies, including Samsung, Nokia/SEL and ITRI. Samsung indeed seems to be quite close to actual foldable-display commercialization and demonstrated two foldable OLED prototypes towards the end of 2014 - a 5.5" (WQXGA, 2048x1526, 464 PPI) panel that folds in half and a 10" tri-foldable AMOLED (Full-HD, 218 PPI). 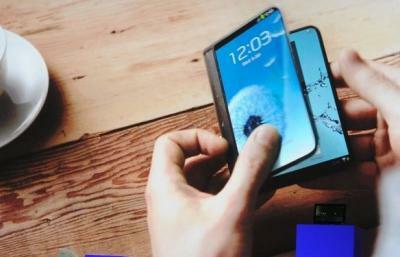 Samsung's original plan was to release a foldable phone in 2015, but this obviously will not happen. Market research company IHS actually expects Samsung to release the first foldable phone in early 2016. The OLED Association also expects Samsung to show a foldable smartphone, but only as a prototype or "near-production" model. Samsung could have released them in 2015 - but they were having an issue with the fold line with too many of them - so their quality assurance group-CTO delayed the release date till when the issue is totally resolved. Which it nearly is, according to information I received from an industry insider. It's an understandable/prudent approach for them. There will be decades of popularity for this type of foldable OLED display screen - so having a delay to allow for a (nearly) perfected model to hit the shelves makes sense.